Product #21145 | SKU 195101 | 0.0 (no ratings yet) Thanks for your rating! 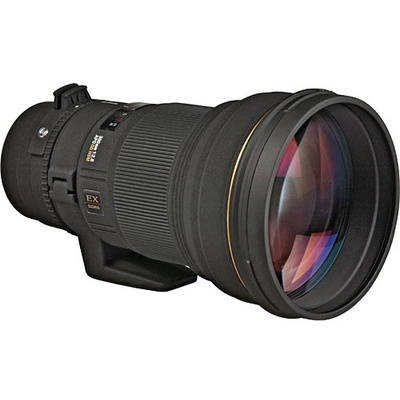 The Sigma APO 300mm f/2.8 EX DG HSM lens is an ultra compact Apochromatic telephoto lens with a fast f/2.8 maximum aperture, and incorporates two Extraordinary Low Dispersion glass elements to reduce chromatic aberration to a minimum. It incorporates internal focusing which enables responsive and fast autofocus speed. A detachable tripod socket and rotatable drop in filter holder are also included. The improved DG lens design corrects for various aberrations. This lens is specially coated to get the best colour balance whilst cutting down on ghosting caused by reflections from the digital image sensor. The lens provides the utmost correction against lateral chromatic aberration, which is a serious problem for digital SLR cameras.